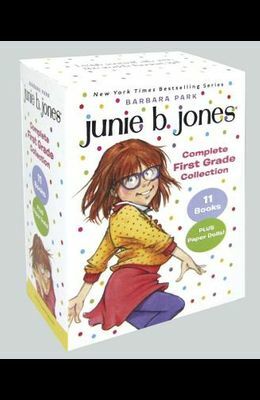 Barbara Park's #1 New York Times bestselling chapter book series, Junie B. Jones, is a classroom favorite and has been keeping kids laughing--and reading--for more than twenty years. Over 60 million copies in print and now with a bright new look for a new generation Laugh yourself silly with the world's funniest kid Now, for the first time ever, all eleven first-grade books are available together, along with collectible paper dolls available ONLY in this special boxed collection Perfect for holiday, birthday, back to school, kindergarten graduation, and teacher gifts USA Today Junie B. is the darling of the young-reader set. Publishers Weekly Park convinces beginning readers that Junie B.--and reading--are lots of fun. Kirkus Reviews Junie's swarms of young fans will continue to delight in her unique take on the world. . . . A hilarious, first-rate read-aloud. Time Junie B. Jones is a feisty six-year-old with an endearing penchant for honesty.